This iniquitous traffick, beginning with the importation of negroes into Hispaniola in 1503, was first pursued by the English in 1562, under Sir John Hawkins, who sold a cargo at the same island that year. The colony of Virginia was planted in 1607. The first cargo of negroes, only twenty in number, arrived there in a Dutch vessel in 1620, and was bought by the colonists. All the commercial nations of Europe were soon implicated in the trade, but England became, on the whole, the leader in this trade, and was unrivaled by any, save her daughter, New England. Reynal estimates the whole number of negroes stolen from Africa before 1776 at nine millions; Bancroft at something more than six millions. Of these, British subjects carried at least half: and to the above numbers must be added a quarter of a million thrown by Englishmen into the Atlantic on the voyage. As the traffick continued in full activity until 1808, it is a safe estimate that the number of victims to British cupidity taken from Africa was increased to five millions. The profit made by Englishmen upon the three millions carried to America before 1776, could not have been less than four hundred millions of dollars. The negroes cost the traders nothing but worthless trinkets, damaged fire-arms, and New England rum: they were usually paid for in hard money at the place of sale. This lucrative trade laid the foundation, to a great degree, for the commercial wealth of London, Bristol, and Liverpool. The capital which now makes England the workshop and emporium of the world, was in large part born of the African slave trade. But after the nineteenth century had arrived, the prospective impolicy of the trade, the prevalence of democratic and Jacobin opinions imported from France, the shame inspired by the example of Virginia, with (we would fain hope) some influences of the Christian religion upon the better spirits, began to create a powerful party against the trade. First, Clarkston published in Latin, and then in English, his work against the slave trade, exposing its unutterable barbarities, as practised by Englishmen, and arguing its intrinsic unrighteousness. The powerful parliamentary influence of Wilberforce was added, and afterwards that of the younger Pitt. Since that time, the British Government, with a tardy zeal, but without disgorging any of the gross spoils with which it is so plethoric, wrung from the tears and blood of Africa, has arrogated to itself the special task of the catchpole of the seas, to "police" the world against the continuance of its once profitable sin. Its present attitude is in curious contrast with its recent position, as greedy monopolist, and queen of slave traders; and especially when the observer adverts to her activity in the Coolie traffick, that new and more frightful form, under which the Phariseeism of this age has restored the trade, he will have little difficulty in deciding, whether the meddlesome activity of England is prompted by a virtuous repentance, or by a desire to replace the advantages of the African commerce with other fruits of commercial supremacy. The share of the Colony of Virginia in the African slave trade was that of an unwilling recipient; never that of an active party. She had no ships engaged in any foreign trade; for the strict obedience of her governors and citizens to the colonial laws of the mother country prevented her trading to foreign ports and all the carrying trade to British ports and colonies was in the hands of New Englanders and Englishmen. No vessel ever went from her ports, or was ever manned by her citizens, to engage in the slave trade; and while her government can claim the high and peculiar honour of having ever opposed the cruel traffick, her citizens have been precluded by Providence from the least participation in it. The planting of the commercial States of North America began with the colony of Puritan Independents at Plymouth, in 1620, which was subsequently enlarged into the State of Massachusetts. The other trading colonies, Rhode Island and Connecticut, as well as New Hampshire (which never had an extensive shipping interest), were offshoots of Massachusetts. They partook of the same characteristics and pursuits; and hence, the example of the parent colony is taken here as a fair representation of them. The first ship from America, which embarked in the African slave trade, was the Desire, Captain Pierce, of Salem; and this was among the first vessels ever built in the colony. The promptitude with which the "Puritan Fathers" embarked in this business may be comprehended, when it is stated that the Desire sailed upon her voyage in June, 1637. The first feeble and dubious foothold was gained by the white man at Plymouth less than seventeen years before; and as is well known, many years were expended by the struggle of the handful of settlers for existence. So that it may be correctly said, that the commerce of New England was born of the slave trade; as its subsequent prosperity was largely founded upon it. The Desire, proceeding to the Bahamas, with a cargo of "dry fish and strong liquors, the only commodities for those parts," obtained the negroes from two British men-of-war, which had captured them from a Spanish slaver. Thus, the trade of which the good ship Desire, of Salem, was the harbinger, grew into grand proportions; and for nearly two centuries poured a flood of wealth into New England, as well as no inconsiderable number of slaves. Meanwhile, the other maritime colonies of Rhode Island and Providence Plantations, and Connecticut, followed the example of their elder sister emulously; and their commercial history is but a repetition of that of Massachusetts. The towns of Providence, Newport, and New Haven became famous slave trading ports. The magnificent harbour of the second, especially, was the favourite starting-place of the slave ships; and its commerce rivalled, or even exceeded, that of the present commercial metropolis, New York. All the four original States, of course, became slaveholding. The present commercial and manufacturing wealth of New England is to be traced, even more than that of Old England, to the proceeds of the slave trade, and slave labour. The capital of the former was derived mainly from the profits of the Guinea trade. The shipping which first earned wealth for its owners in carrying the bodies of the slaves, was next employed in transporting the cotton, tobacco, and rice which they reared, and the imports purchased therewith. And when the unjust tariff policy of the United States allured the next generation of New Englanders to invest the swollen accumulations of their slave trading fathers in factories, it was still slave grown cotton which kept their spindles busy. The structure of New England wealth is cemented with the sweat and blood of Africans. In bright contrast with its guilty cupidity, stands the consistent action of Virginia, which, from its very foundation as a colony, always denounced and endeavoured to resist the trade. It is one of the strange freaks of history, that this commonwealth, which was guiltless in this thing, and which always presented a steady protest against the enormity, should become, in spite of herself, the home of the largest number of African slaves found within any of the States, and thus, should be held up by Abolitionists as the representative of the "sin of slaveholding"; while Massachusetts, which was, next to England, the pioneer and patroness of the slave trade, and chief criminal, having gained for her share the wages of iniquity instead of the persons of the victims, has arrogated to herself the post of chief accuser of Virginia. It is because the latter colony was made, in this affair, the helpless victim of the tyranny of Great Britain and the relentless avarice of New England. The sober evidence of history which will be presented, will cause the breast of the most deliberate reader to burn with indignation for the injustice suffered by Virginia, and the profound hypocrisy of her detractors. The preamble to the State Constitution of Virginia, drawn up by George Mason, and adopted by the Convention June 29th, 1776, was written by Thomas Jefferson. In the recital of grievances against Great Britain, which had prompted the commonwealth to assume its independence, this preamble contains the following words: By prompting our negroes to rise in arms among us; those very negroes whom, by an inhuman use of his negative, he had refused us permission to exclude by law. Mr. Jefferson, long a leading member of the House of Burgesses, and most learned of all his contemporaries in the legislation of his country, certainly knew whereof he affirmed. His witness is more than confirmed by that of Mr. Madison, who says: The British government constantly checked the attempts of Virginia to put a stop to this infernal traffic. Mr. Jefferson, in a passage which was expunged from the Declaration of Independence by New England votes in the Congress, strongly stated the same charge. And George Mason, perhaps the greatest and most influential of Virginians, next to Washington, reiterated the accusation with equal strength, in the speech in the Federal Convention, 1787, in which he urged the immediate prohibition of the slave trade by the United States. A learned Virginian antiquary has found no less than twenty-eight several attempts made by the Burgesses to arrest the evil by their legislation, all of which were either suppressed or negatived by the proprietary or royal authority. ...Be it enacted by the General Assembly, That from and after the passing of this act, no slave or slaves shall hereafter be imported into this Commonwealth by sea or land, nor shall any slave so imported be bought or sold by any person whatsoever.... Every person hereafter importing slaves into this Commonwealth contrary to this act, shall forfeit and pay the sum of one thousand pounds for every slave so imported.... And be it further enacted, That every slave imported into this Commonwealth, contrary to the true intent and meaning of this act, shall, upon such importation, become free. Thus Virginia has the honour of being the first Commonwealth on earth to declare against the African slave trade, and to make it a penal offence. Her action antedates by thirty years the much bepraised legislation of the British Parliament, and by ten years the earliest movement of Massachusetts on the subject. Almost before the Clarkstons and Wilberforces were born, Virginia did that very work for which her slanderers now pretend so much to laud those philanthropists. But it may be said, that if the government of Virginia was opposed to the African slave trade, her people purchased more of its victims than those of any other colony; and the aphorism may be quoted against them, that the receiver is as guilty as the thief. This is rarely true in the case of individuals, and when applied to communities, it is notoriously false. All States contain a large number of irresponsible persons. The character of a free people as a whole should be estimated by that of its corporate acts, in which the common will is expressed. The individuals who purchased slaves of the traders were doubtless actuated by various motives. Many persuaded themselves that, as they were already enslaved, and without their agency, and as their refusal to purchase them would have no effect whatever to procure their restoration to their own country and to liberty, they might become their owners, without partaking in the wrong of which they were the victims. Many were prompted by genuine compassion, because they saw that to buy the miserable creatures was the only practicable way in their reach to rescue them from their pitiful condition; for tradition testifies that often when the captives were exposed in long ranks upon the shore, near their floating prisons, for the inspection of purchasers, they besought the planters and their wives to buy them, and testified an extravagant joy and gratitude at the event. The proper rulers were forbidden by the mother country to employ that prohibitory legislation which is, in all States, the necessary guardian of the public virtue; and it is therefore that we place the guilt of the sale where that of the importation justly belongs. The government of Virginia was unquestionably actuated in prohibiting the slave trade, by a sincere sense of its intrinsic injustice and cruelty. But one more fact remains: When the late Confederate Government adopted a constitution, although it was composed exclusively of slaveholding States, it voluntarily did what the United States has never done: it placed an absolute prohibition of the foreign slave trade in its organic law. 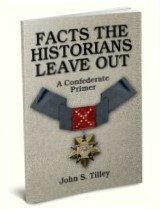 This article was extracted from Robert Lewis Dabney, A Defense of Virginia and the South (New York: E.J. Hale and Son, 1867). Click HERE to purchase this title.